May be, I am from an old school, wherein the importance of handwriting was stressed as the most essential quality a primary student had to develop. So we had the writing book, two lined and four lined for Malayalam and English. I cannot count as to how many times I got castigated by Ms Murphy, our English teacher, for my illegible hand. In order to develop writing skills in our son, I decided to procure a fountain pen for him. To my surprise I found none available in the Toronto Area. Some arts shops carried calligraphy pens, but not the good old fountain pen. Then I requested my brother to procure half a dozen of them from Kerala and send it with a friend of ours visiting Kerala. Fountain pens are nowadays used mainly by Urdu and Chinese language writers. In these languages, calligraphy plays an important role as the strokes and their thickness may alter the meaning of the words. Then why use a costly fountain pen when 100 pens for $2 deal on disposable ballpoint pens are there in the market and when we are mostly writing in English language? Many of the people using fountain pens today grew up doing so. Fountain pens used to be on the list of required school supplies. Those writers may simply be accustomed to using fountain pens or enjoy the nostalgic feeling that comes with it. Using a fountain pen may remind people of simpler times, when good handwriting skills were praised, rather than how many words per minute you can type. A student using a fountain pen may attract comments from his friends like “a grandpa’s times pen”; “why are you using a stone-age tool?” or “Hey, that’s really cool”. In a sea of laptops, ipads, and tablets, a student using an actual pen, let alone a fountain pen, can be shocking, and on some occasions, very much appreciated. Our son says that at school he stands out real cool as he is the only one using a fountain pen. There are also technical advantages of using a fountain pen. The liquid ink flow requires less pressure when writing which reduces cramping and overall discomfort when writing. Fountain pens are great for those with weak wrists or hands, and carpal tunnel. The quality and variety of fountain pens is also very attractive. Fountain pens, if well maintained, can last for decades. When you write with a pen rather than typing it on a computer, the writings last as there is no “Backspace” or “Delete” button. Whatever one wrote remains on paper and can be referred to later, even though one did not like what one wrote at that time. May be in a different context or situation it may come handy. Think your creation which you wiped off on a computer screen with the delete button. At many times, you cannot recover it. Fountain pens may be more expensive than a pack of ballpoint pens, but they last for a lifetime, making them much more ‘eco-friendly’ than your usual disposable pens. There is also more variety when it comes to fountain pens. They can be tailored to suit the needs of their user. Left-handed options, pen styles, nib sizes, and the vast spectrum of ink colors allow users to customize their pen to fit their unique personal style. In addition to their unique design, fountain pens offer a larger range of writing styles. Depending on nib, hold, and angle of the pen, writing styles can be altered and changed accordingly. So why, with all these advantages are people still buying disposable pens? . Fountain pens need careful maintenance in order to prevent leaking and promote long lasting use. Refilling your fountain pen can be messy and tedious. This task would be a great exercise for children in enhancing their concentration and delicate handling. Taking fountain pens on airplanes can be risky because the air pressure changes at high altitude may cause ink explosions, and unless you like to unintentionally dye your clothes, most people view this as an inconvenience. 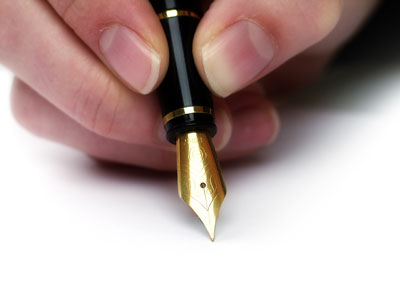 Fountain pens will surely improve the handwriting of the person using it, it also make you feel different and your creativity will surely be better than using a ball-point pen or typing out on a computer screen, Why don’t you try it for once and see the difference.